This recipe for “Hidden Surprise Easter Egg Treats” was too hard to resist. 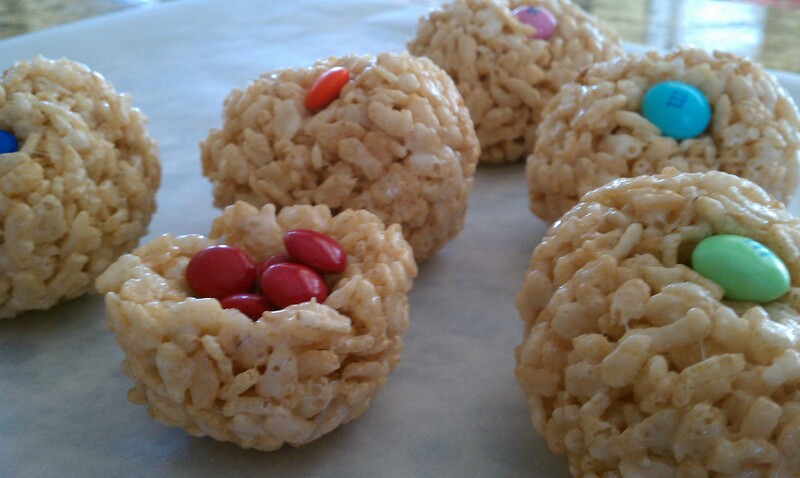 You use the ingredients for Rice Krispie Squares, but instead mold the ingredients into plastic egg halves and fill with M&M’s. My girls had a ton of fun making them — there is nothing quite like using melted marshmallows as glue, and getting to snack on M&M’s throughout the process. While these aren’t going to win any healthy food competitions, they are pretty light as far as dessert goes, and we opted for the whole grain “brown” Rice Krispies. Most importantly, they got a good lesson in improvisation: we were making six eggs (and there would be six people at our dinner table), but the eggs must have been a little two large, as we ran out of “egg” near the end and had to make one “nest”. My mother was gracious enough to request that one. Clean, then coat the inside of plastic eggs with cooking spray. In a medium saucepan, melt butter over low heat. Add marshmallows and stir until completely melted. Remove from heat. Add Rice Krispies and stir until well coated. Using greased hands, firmly press 1/4 cup of the cereal mixture into each plastic egg half. Use fingers to make hollow center in each half. Remove from molds. Place on wax paper and cool slightly. Place about 6 M&M’s in one half of each egg. Gently press two halves of each egg together until they stick. Cool completely. As if I didn’t already have enough cookies around (with 200 boxes of Girl Scout cookies at my front door waiting to be sold), I decided I wanted to bake a couple dozen more. My daughter Samantha had a friend over for a play date, so I’ll use that as my excuse for needing to bake cookies. I have a long-standing love affair with homemade peanut butter cookies, so this Looneyspoons recipe by Janet & Greta Podleski had been calling my name for some time. It is very simple to throw together, and the saltiness combined with the chocolate chips is totally addictive. 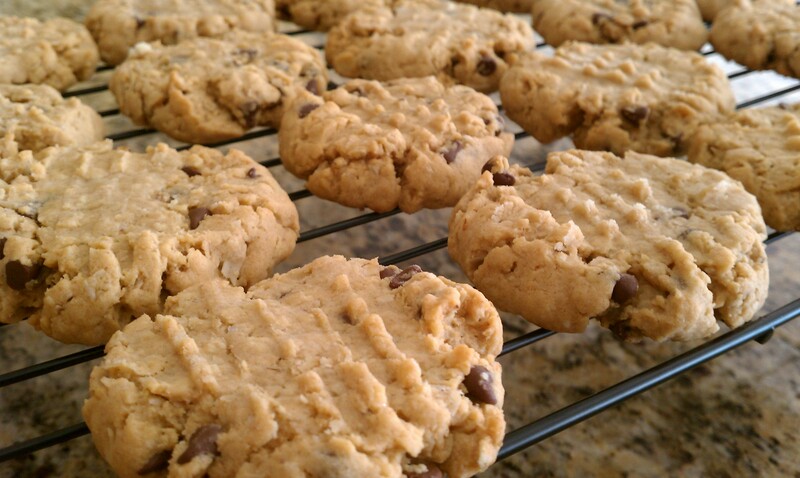 But with oats, peanut butter, and whole-wheat flour (in my version), it’s a relatively healthier cookie. Oh, Samantha and her friend liked them too. Preheat oven to 350F. Line 2 cookie sheets with parchment paper. In a medium bowl, combine flours, oats, baking soda, and salt. In another medium bowl, beat together brown sugar, butter, peanut butter, and egg on low speed of electric mixer until well blended. Add dry ingredients and chocolate chips and mix well using a wooden spoon. Dough will be stiff. Roll dough into 1 1/2-inch balls and place 2 inches apart on cookie sheets. Using a fork dipped in flour, flatten cookies to 1/4 inch thickness. Bake for about 10 minutes. Remove from tray immediately and cool on wire racks. Makes 24 cookies.